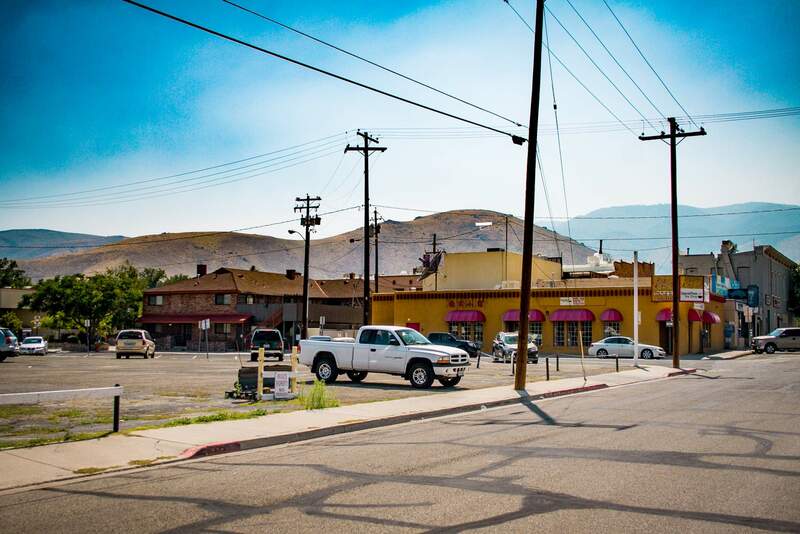 Another photo from local photographer Tom Davis shows another lost part of town. Today we know that to the east of the Carson Nugget there is a huge parking lot. If you measure it off, it comes to 8 full city blocks worth of parking, with almost no structures within that area, except for a restaurant and an office building along Stewart Street. But long-time residents will remember that all this land used to be a neighborhood, with the streets lined with houses just like any other neighborhood. Starting in the 1970s this neighborhood was wiped out as the need for parking grew. Between the Nugget, the state offices in the Capitol Complex, and the rest of downtown, it was more important to have this land as a place to store cars than as homes for families. One by one the houses were bought up and demolished. Tom Davis caught this house in the 200 block of East Telegraph during its last days. There is another house behind it that still looks lived in, but its time would come too. Today all these houses are gone. No trace remains. The last house from this neighborhood was demolished in 2011. The houses have been gone so long that even the parking lots that replaced them are now aging and cracking. This land is now considered a prime spot for the redevelopment of downtown Carson. With so much empty land all in one place, several proposals have been put forward for plowing this all under once again and building apartment buildings, office buildings, and retail space on this land. 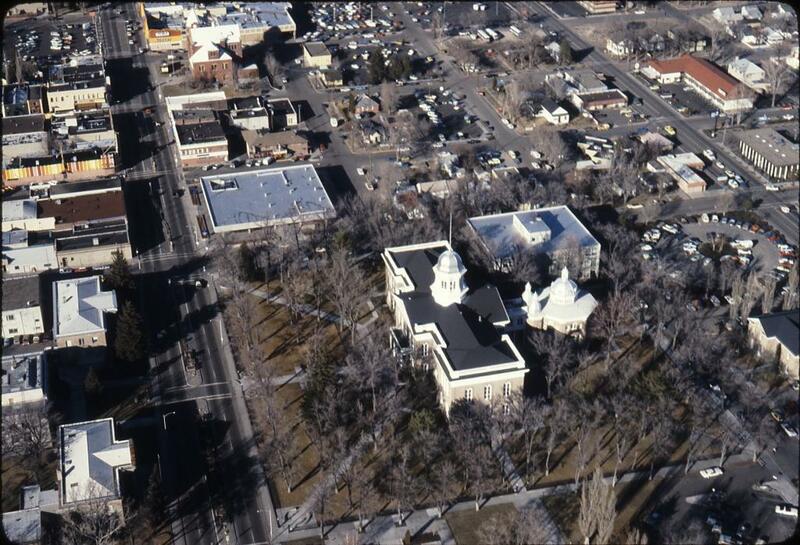 One plan even involved relocating the Carson City Library to this neighborhood. But all of those proposals have died for one reason or another. So the parking lots remain, sitting largely empty most of the time. This neighborhood might see a renaissance one day, but for now it, like the houses that used to be here, is mostly forgotten. 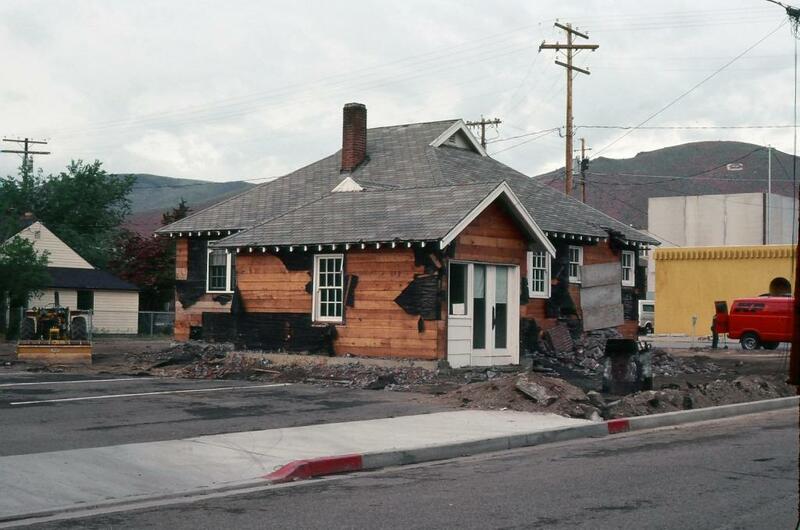 This photo from the 1980s shows when the neighborhood was about half gone. The rest of it would be removed over the next decade or so. 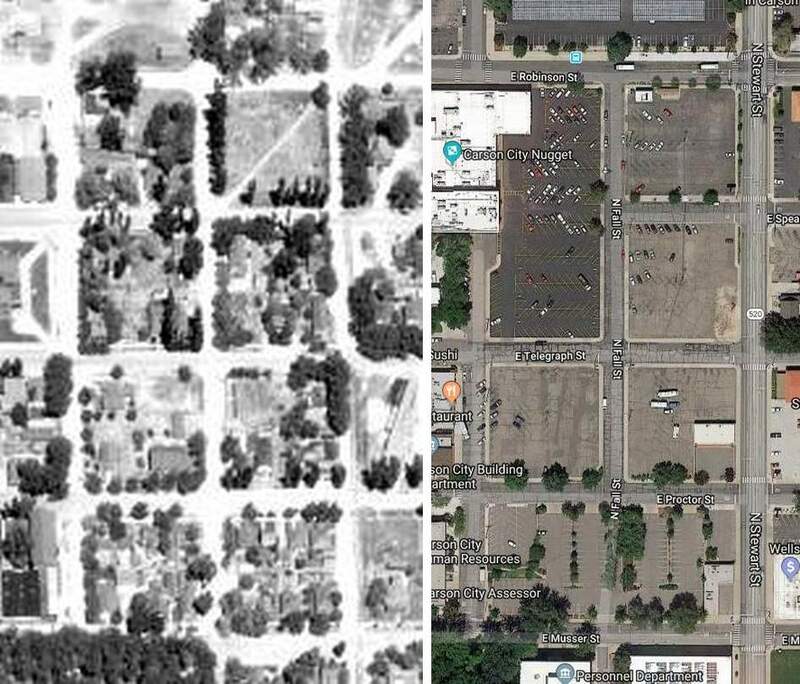 A comparison of aerial views of the neighborhood, from 1954 and 2018. And as a bonus bonus, you can see the Oddfellows Hall in the lower left of the 1954 photo.